1799: Jonathan Stevens provides land on the hill north of the meeting house and subscribers, seeing the success of Phillips Academy in the South Parish of Andover, invest in the Old Center of the North Parish. 1801: The Trustees of the Free School in the North Parish of Andover incorporate, specifying that the school undertake “...instruction of Youth of both sexes, in reading, writing and Arithmetic." 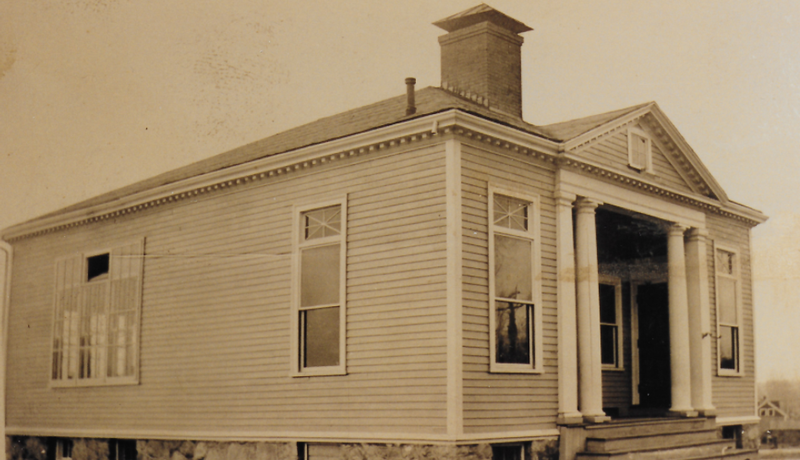 It was the first school in the Commonwealth to accept girls as well as boys. Students came to Franklin Academy from all around the county, the country, and the world! Note Daniel DeWall from South Africa. This is part of the student roster from 1802. The students ranged in age from 9 to 30. Some students, usually the younger ones, who did not come from the Andover area, would live with the Preceptor or board with local families. 1803: By an Act & Resolve of the Commonwealth, the Trustees successfully appeal to permanently change the name of the school to Franklin Academy, in honor of Benjamin Franklin. 1825: Preceptor Simeon Putnam enters into a feud with the Trustees. He leaves Franklin Academy and builds his own academy on the Parson Barnard property. It was hastily erected on the back of his carriage barn. 1827: The Trustees sign an agreement with Putnam and Cyrus Pierce to lease Franklin Academy which they operate as a school for boys, and Putnam’s Academy becomes the “Female Department”. Franklin Academy relocated on Osgood Street to store Hay. It remained on the site of the Parson Barnard property until it was badly damaged by a fire in 1905. 1852: The School is closed and is moved down the road to be used on the Bailey Farm to store hay. It remained on the site of the Parson Barnard property until it was badly damaged by a fire in 1905. Some of its parts (beams and a frieze) were salvaged and used in the erection of a new school on Park Street, The Franklin School. Today this building is used by the VFW Post 2104, and the present day Franklin School, built in 1958, is on Cypress Terrace off of Andover Street. New Franklin School on Park Street, built in 1905. Today this building is used by the VFW Post 2104.